The Astros and the Yankees have set their rosters for tonight's AL Wildcard at Yankee Stadium. Both teams can reset their 25-man rosters for the divisional round after the one game wildcard match up. So, it is only a mild surprise that the Astros decided to bring nine pitchers. The Astros bring with them two Dominican players to New York. Eight of the nine pitchers are American, with Oliver Perez hailing from Mexico. Drug kingpin Chapo Guzman is probably a big fan of Perez, as he is from Culiacan, Sinaloa. The Tomateros de Culiacan have been very successful in the Mexican Pacific League, winning ten domestic titles and two Caribbean World Series. There are four Latin players in the Astros infield group, but only one of them is from the Dominican Republic. Jonathan Villar is from La Vega, DR. Back in 2011 he was a top 100 prospect, and he has played with the Astros for the last three seasons and been one of their first outfielders off the bench. Villar has also played and started for the Aguilas in the Dominican Winter Baseball League, and had a home run in the playoffs back in January. Unfortunately for Villar he is behind Puerto Rican sensational rookie Carlos Correa, so he will likely be used only as a pinch hitter. for the Astros. Photo by Arturo Pardavila III on Flickr. 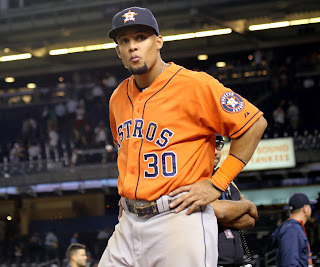 The only other Dominican player that the Astros bring to the AL Wildcard is outfielder Carlos Gomez. When he made his debut in 2007 with the Mets, Gomez was the youngest player in National League at 21 years old. He has since had a successful nine year MLB career and made two All-Star games with the Brewers before being traded to the Astros this year. He has been injured, but will be starting in center field. Carlos is from Santiago, so it is natural that he has played for the Aguilas in the Dominican Winter League for a number of years, even appearing with them after he became an All-Star. While the Astros only have two Dominicans on the 2015 AL Wildcard roster, they also have three players from Venezuela, one from Mexico, and one from Puerto Rico. Not surprising considering their GM, Jeff Luhnow, speaks Spanish and has strong ties to Latin America as he grew up in Mexico City. The Yankees on the other hand, bring three Dominican players to the wild card contest. Or four if you count Alex Rodriguez, but considering he was born in Miami, I consider him an American player. Two pitchers, Ivan Nova and Luis Severino will be in the bullpen for the Yankees. Nova was one of the top prospects in all of baseball when he was coming up, and has had a fairly successful six years in the majors, posting a 4.33 ERA in over 600 innings. He is from Palenque and has played for Escogido in the Dominican Winter League. Severino has had a highly successful debut season this year, after being named to some AAA All-Star teams. The third Dominican player that the Yankees have on the roster is a rookie that only played in two games. Gary Sanchez is another can't miss prospect and has made All-Star teams at every level including a Futures team this year. This seems to be a move to get a young player some playoff experience. Gary is from the capital of Santo Domingo and has played for one of two great teams in the capitol, Escogido. The winner of this one game wild card may reshuffle the roster before facing Kansas City in the next round. Keith is the sole contributor to this blog. He has a BA and an MA, both in anthropology. His work focuses on international aspects of sports and culture. Keith has been your Dominican baseball expert since 2009 when he spent the entire LIDOM season in the DR following the Gigantes del Cibao....Basically, I know more about baseball in the Dominican Republic than you do.